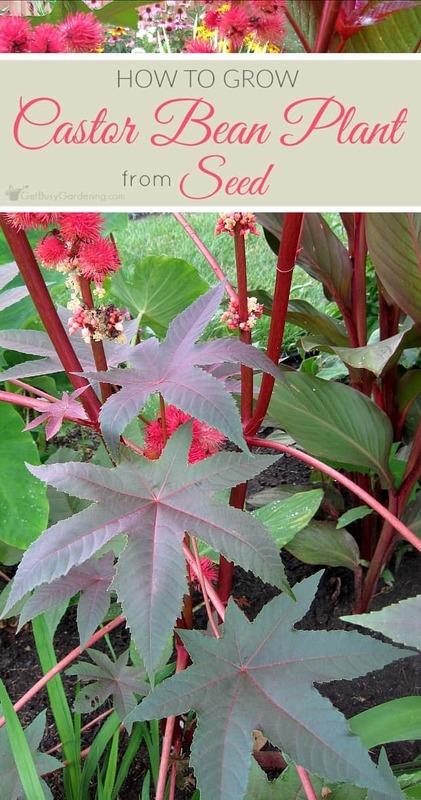 Castor bean is a fast growing tropical plant, and it’s one of my favorite annuals. I love my red castor beans, they add a wonderful contrast of color and texture to my tropical garden. I get tons of compliments on them, and everyone asks what they are. Every fall I collect the castor plant seed from my garden, and then plant them again in the spring. It can be a bit tricky to germinate castor bean seeds, but it’s well worth it to grow these gorgeous plants! 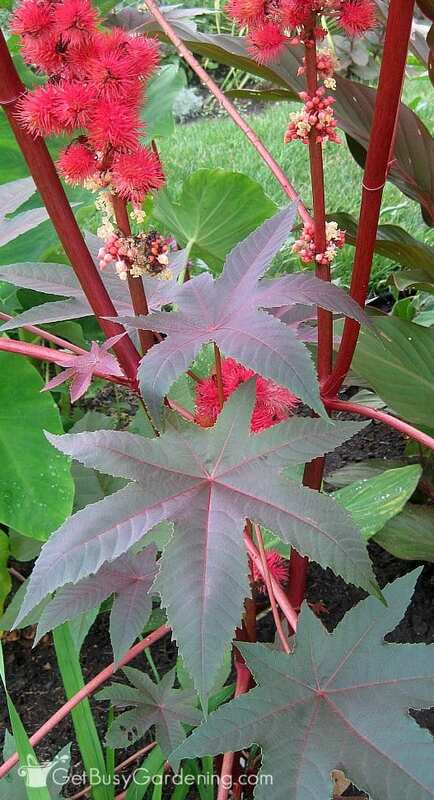 It’s true that castor plants (especially the red castor bean plant) are beautiful additions to the garden… but be careful with this one. Castor beans (all parts of the plant and it’s seeds) are poisonous if ingested. So you might not want to grow it in your garden if you have pets or kiddos running around. Castor beans can be really easy to grow from seed, but they can sometimes be challenging too. Castor bean plants need a full sun location and lots of heat to grow their best. They will tolerate shade, but the plant will stay small. Choose a location in your garden where the castor bean plant will be protected from high winds. It’s best to grow castor plants in fertile soil that drains quickly. They like a lot of water, but they don’t like soggy soil. You could grow them in a large pot, but their growth will be stunted. If you don’t know where to buy castor bean seeds, here is the type I grow… red castor bean seeds. Castor bean plant seeds can be sown directly in the garden; but in areas with short growing seasons like mine, it’s best to start them indoors 4-6 weeks before last frost. Castor plant seeds are not a good candidate for winter sowing, they will only rot. 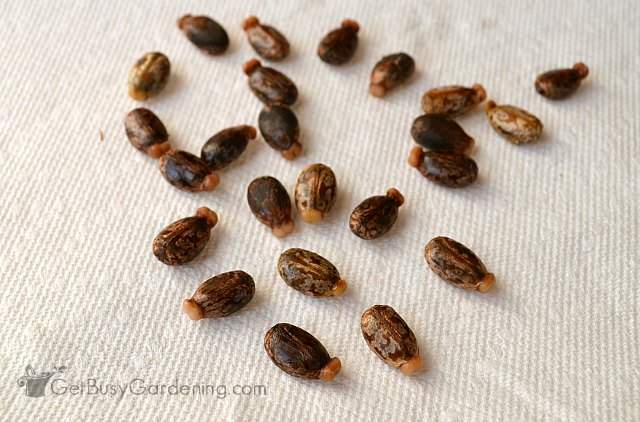 Castor bean plants can be challenging to grow from seed, but there are a few steps you can take to make it easy to germinate castor seeds. 1. 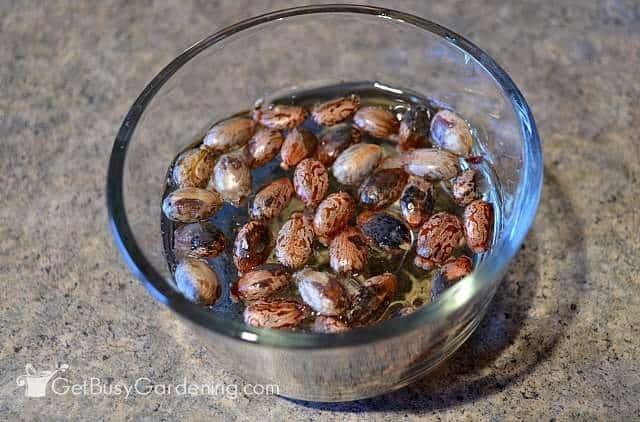 Soak castor bean seeds: The first step for successfully germinating castor plant seeds is to soak them in warm water before sowing. Soak castor seeds for about 24 hours before planting. After soaking the seeds, it will look like one end has popped out – this is normal. To give your castor bean plant seeds even more of a boost, try soaking them in diluted organic fish emulsion, liquid kelp or compost tea. 2. Choose the right container: It’s a good idea to plant castor bean plant seeds in a deep container, unless you plan to transplant them shortly after they start to grow. Once castor plant seeds have germinated, the seedlings grow very quickly. It only takes a few days for the seedlings to outgrow seed starting trays. You could start castor bean seeds directly in plantable peat pots to make transplanting them to the garden a snap. If you prefer to use something more sustainable than peat, try coco coir or cow pots instead. 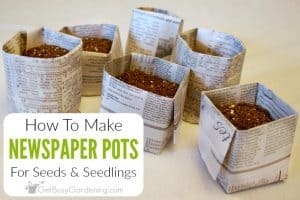 Otherwise, plastic seedling pots are perfect (and reusable). It can take a long time to germinate castor bean seeds, so be patient. The typical germination rate for castor seeds is 10-21 days. I’ve had castor plant seeds take as long as a month before finally sprouting, so don’t panic if it takes longer than what it says on the seed packets. Castor beans need warm soil to germinate, so adding bottom heat using a seedling heat mat will help castor bean seeds germinate much faster, and lower the risk of seed rot. Castor plant seedling lighting – After castor bean plant seeds finally sprout, the seedlings grow very fast. As soon as you start to see the seedlings popping up, it’s time to add a grow light. Since they grow so fast, a seedling grow light is a must for growing castor bean seedlings indoors to prevent them from growing weak and leggy. I made my own seed starting grow lights using an inexpensive florescent light fixture and plant grow bulbs, which works great. Make sure the light hangs an inch or two above the seedlings at all times, and keep it on for 14-16 hours per day (use an outlet timer to make it easy to control the lights). 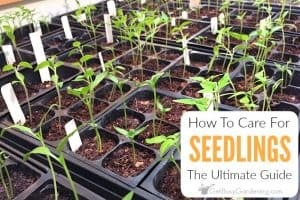 Check a few times per day, and adjust the height of the light as the seedlings grow. 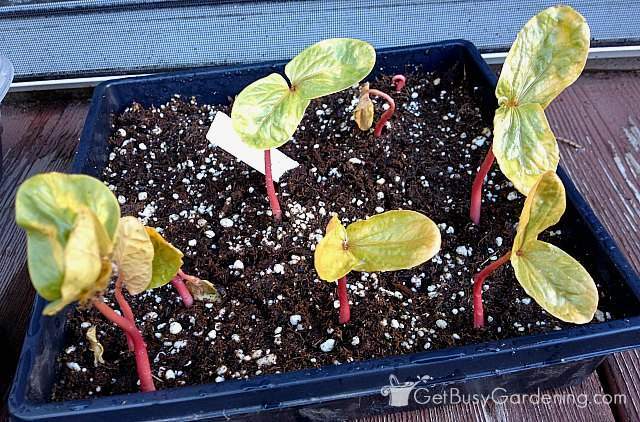 Fertilizing castor bean plant seedlings – Once your castor bean plant seedlings grow their first set of true leaves, it’s time to start fertilizing them. I prefer (and highly recommend) using an organic fertilizer like organic fish emulsion or an organic compost solution. You could also buy compost tea bags and brew your own liquid compost fertilizer. Start with a weak half dose, and gradually increase it to full strength over time. 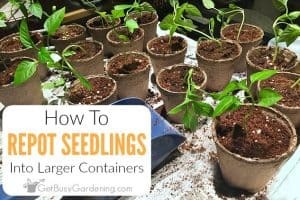 Learn more about how to care for seedlings here. Before you can plant your castor bean seedlings into the garden, they must to be hardened off to get them ready for life outdoors. Once that’s done, wait to transplant them in the garden after all chance of frost is gone and the soil has warmed up. Castor bean plants hate the cold, so it’s best to wait to plant them than risk planting them too early. If the soil or weather is too cold for them, the seedlings could die or their growth could be stunted. 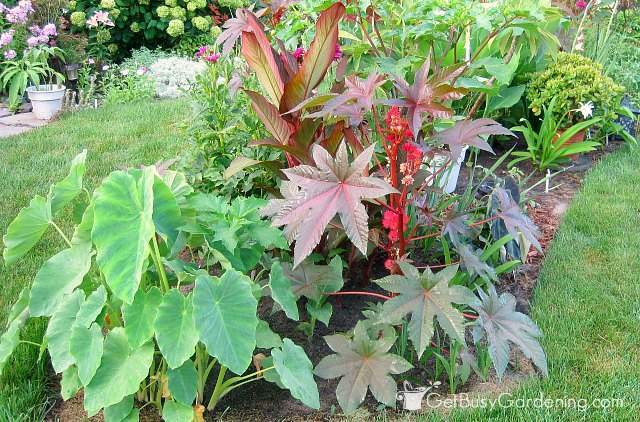 Castor bean plants are fun to grow, and they add gorgeous color and texture to the gardens. But remember, all parts of the castor bean plant, especially the seeds, are poisonous if ingested. If you’re concerned about the toxicity of the seeds, you can cut off the flowers to prevent castor plant seed formation. Keep castor bean plant seeds out of reach of children and pets. Share your tips for how to grow castor bean plant from seed in the comments section below. Following your advice (sorta), I had a few spikes of nice seed pods from my castor beans. I left them out past a hard frost that destroyed the rest of the plants including a couple of the spikes of seed, but the three huge spikes I did grab look fine. I've been drying the spikes in my laundry room up high from grabby hands since. Sounds like you're doing everything right. I usually store my seeds in the pods because I'm too lazy to pop them all out in the fall. I pop them out of the pods when it's time to germinate them in the spring. 🙂 You could store them either way. Does the nub have to pop out? I don’t think it is required, but the nubs pop out on all of mine. It might be different for other varieties of castor bean though. Thanks Amy for the info , sorry if i seem a little dense but is the redish /pink flower the pod ? I would not. The pods are pretty hard, and that might limit the viability of the seeds. But if you have a lot of seeds to spare, you could experiment. Yes, all parts of the plant are poisonous. Yes, they are poisonous, you definitely do not want to eat them!! LOL, yes, only if you eat them. Do castor bean plants come back every yr. or do you have to plant new beans? You have to replant the seeds every year. Or..If you life in a very mild climate, or you lived in an area that has had a mild winter. It is August, and I am sill cutting down dozens of volunteer plants that keep popping up in my lawn from last year’s plant’s. To give you some idea where the Zone is in which we live, we live in St. Louis, MO. This mild winter, I didn’t have to dig up my Elephant Ears, either. This year, their leaves wee 5 feet x 4 feet! I have a couple “Giant” castor Bean plants that have not yet produced seed pods that came from seed the saved from last year. I have also used the same seed for the plantings in our flower beds. They they have turned into “normal” Castor Bean” flowers. I gave my neighbor 4 to 5 seeds that I had left of from last year, and she has a “Giant” growing in her flower beds, too! Mind you, these plants have no yet set a single seed on them, and both plants, my single plant and he single plant, are taller than our homes by several feet!. They are not the ‘Green’ variety, which is known to grow very tall, but these are ‘reds’ which don’t grow much over 10 – ft 12 tall. Does anybody know any way I can propagate these two plants without seeds? maybe agar peri dish style??? Wow, sounds amazing! I’m not sure how else you could propagate them. They might still have time to set seed. I usually don’t harvest the seeds until October here in Minnesota. Yes, those pink things will end up being part of the stem. Mine sometimes try to pop out of the ground too, but the roots find their way back in. I don't think you need to worry about pushing them down. I hope they will do well for you! I love the look of them in my garden, but I am careful because they are so poisonous. Good luck with them, I hope they will do well for you. Awesome! Seed trading is so much fun and you can fill a whole garden for pennies! I ordered Sanguineus Castor Bean seeds online. The seeds that I received or microscopically small and they appear black. They do not look anything like your picture. Did I get the wrong seeds? What type of Castor Bean plant is pictured here? Thanks for all this wonderful information…I have a question…after the 24 hour soaking…and the knob pops out of the seed…is that the root or the stem of the plant? Should I plant the bean in the dirt with the knob up? I’m not sure, I’ve never dug them up to see (I should do that next time!). I just lay them on their sides when I plant them. 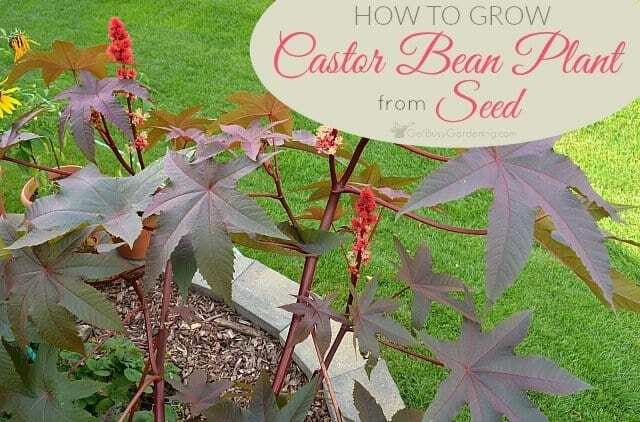 I have planted castor bean plants for years in my garden and have collected their seeds. I have never soaked them before this year. Very interesting. I was wondering if the swollen nub is the root or the stalk coming out? Which way is down when planting the seed. I had always just laid them in the pot. I just lay them in the pot too. I don’t think there’s a right or wrong way to plant them. I grow castor beans every year by selecting a few sprouting plants from the hundreds of volunteers that sprout from the previous year’s dropped seeds. I just nurture the few that happen to be in the locations I desire. I also harvest the seeds in case I or anyone needs them. I have had strangers knock at my door to ask what the plants are–mine usually grow up to twenty feet tall (full sun all day and some fertilizer). The seeds are poisonous, I don’t know about the leaves. Funny, I have heard they can be invasive in warmer climates. They don’t reseed themselves here in Minnesota. Wow, 20 feet tall?? Mine have never gotten taller than 5-5 1/2 feet. You must have the giant variety, which is different than the one I have. All parts of the plants are poisonous. Awesome! It really is a great plant! I have tried planting the seeds straight in the pot to start without luck. Thanks for the tip. I will try that in the spring. As well, I got my seeds from my neighbour and his plants come up every year about 7′ tall for the past 7 years I’ve been here.They are beautiful each and every year. Might this be a different variety of Red Castor here in Southern Ontario,Canada? You’re welcome! I think there are a few different varieties of the red castor bean plant, yours may be different but the seed germination steps should be the same. I have a caster bean growing in my back yard that is close to 14 feet high and probably 5 feet accross. If you like to see pictures of it, just send email to me. It depends on the variety of castor bean plant you have. Some are hardy down to zone 8 and will live for years. Some are only annuals, and will die after a year. If you have a shrub variety, and you can protect it from frost and freezing, it should survive for you just fine. I grow castor beans (Zanzibariensis cultivar) in my garden every year, and they grow fast! I grew some green casstor plants last year that tolerated some frost but dropped dead when it went below 30F. This year i have 2 gibsonii varieties. One from Germany, and one from Oregon. These guys literally grow noticeably everyday. I also have a rare zanzibar variety, a giant zanzibariensis variety, and I will be getting a bright red armencita in. I researched these plants and they say to space the plants with at least 6 “true” leaves 7ft apart. I planted a green castor bean last year in SD and it grew to about 7-8ft with leaves 2.5ft across. 3in wide trunk and it well had a pile of dead flies on the ground. The seedlings grow at a rate I estimate 1/6in every day. I recently had two zanzibariensis beans germinate in 1 1/2 days in PURE water. Freaked me out because I am always seeing 10-21 days. I know they germinated because when they do, their seed shell breaks open due to the seed swelling due to germination. I have extremely good luck with wrapping them up in a warm moistened paper towel in a Ziploc baggy near a heat vent. I shall include a link to the German gibsoniis because well, if your like me then you will realize that this particular kind is VERY beautiful. I also found a gibsonii that is cold hard to zones 5-11. (perennial in zones 7-12 apparently). Your German verity sounds interesting zone 6 ere so start fresh seeds each year here….. Yes, those spiky seed pods can make it difficult. I wear gloves and sometimes I need to use a nut cracker to get them open, or I use a letter opener or something to pry them open. Wow, what do you do with all those seeds? I have grown castor beans for years from seed. I use them for a background for an oriental look with dark leaved canna and other annuals such as yellow zinnias. I too grow caster beans every year and don’t see any mole/vole holes where they grow. The directions here are Spot on! Thank you for a gr8 site! I grow castor bean pants every year – just started mine today, actually. Another side benefit you didn’t mention is that castor bean plants are a natural mole repellant. Great info here. Thanks! Yes, that’s a great point! Thanks for mentioning it. Just got 20 today in mail (6 were not crushed). Plant your castor beans 36-48 inches apart. I plant the seeds on their side, they will figure out which way is up. I planted 70 castor beans…most didn’t survive. I did everything I was supposed to do but mine AREN’T Growing…it’s almost the middle of July and they’re only 3-4 inches tall….What do you think happened? I have 2 questions. First, does it work with green castor bean plants? And second, how long does the plant take to fully grow? It should, I haven’t grow green castor bean plants before. Castor bean plants are fast growers, it only takes a few months until they’re full grown if they get the right growing conditions. The hotter and sunnier it is, the faster they will grow. Okay so I am just wondering if you know. The real deadliest plant is the rosary pea plant, and I was thinking about growing them. I read online they are extremely hard to grow, but that site did not mention if the pods were dry or green. Since you seem good at growing different plants, I was wondering if you know anything about abrus precatorus. If you know anything about rosary pea germination. If you do please tell me. Sorry, but I don’t know anything about those plants. It’s ok. I’m reconsidering anyway, since I have a pretty large garden anyway (for a starter gardener anyway). I have a problem. My first castor plant I tried to grow has not sprouted for a month. I dug it up. No roots. No SEED. I think it degraded. My other I’m not sure. I am ordering new ones. I am getting fish emulsion and some kind of heat source. What do you recommend? I did soak them. But I did for 24 hours and one of the ends did not pop out. Maybe I should leave it in 48 hours? I guess. I will wait until the tops pop themselves. And I will also let them germinate in a warm, indoor environment. The first one I didn’t soak, so I can see how it will do. The others are being soaked. One of those 2 I am planting in a pot. I hope I am not making too many changes with each seed. U just hope they grow. I meant I, not U. Great, hope they will grow for you. Me too. My greenhouse should be an essential. Great news!One of my castor beans is sprouting! There is a little red bud that is sticking out, like the one in the picture. I have a question. I will transplant this tomorrow. But since it is fall, should I keep it indoors during the winter? I don’t mind if it is a small castor plant. I just wonder how much sunlight is required. Woohoo! Congrats. Castor bean plants are not hardy, and will die if exposed to frost or freezing temps. If you live in a cold climate, then yes, you’ll have to grow them inside. They require full sun, and you’ll probably need to add a grow light so it doesn’t get leggy. Keep in mind that castor bean plants are annuals, so it probably won’t live more than one year. Come spring, you can plant it in the garden and it should thrive. Just be careful growing these inside if you have kids or pets, because every part of the plant is extremely poisonous. Thanks. I have a bad house, so I am not sure how a heat lamp will work with the wiring. I will consider it, especially since I have other plants growing in my garden. And btw, I have spent months studying the beans. Though the beans are extremely deadly, I plan to take precautionary measures. I wash my hands after touching the seedlings. Oh, and you are right! They grow quick! It only took 24 hours for the seedling being a tiny red bud ti being a few inch tall plant with two starter leaves. Thanks for all the advice. Fantastic! I’m so glad to hear that your seedling is thriving. Isn’t it amazing, you can practically sit and watch them grow. I do wonder something. How long do your castor plants live, because I saw photos of a castor plant in Greece that looks a LOT more like a tree. Mine only live through the summer because they’re killed by frost in the fall. Hi Will, don’t worry, I’m not attempting to grow them through the winter. 🙂 I live in Minnesota zone 4b. I grow castor beans as annuals only. Will. Again… I grew castors again this year..found a trick to tall tall plants is dig a deep starter hole…I used a post hole digger to spot plant some castors… They all grew taller by three feet, compared to everyone else who I gave seedlings to… They also LOVE. Alaska fish emulsion …. Makes great castor food. ….zone 6 here…summer has peaked in this heck of the woods…. Interesting, thanks for sharing your tips! Actually, castor plants are everywhere in Florida. They are also about 15 feet tall, kind of like the mimosas of alabama, or the hogweed of michigan. But hogweed is worse based on public safety. And I love in zone 8. My friend always had these. She called them “ticks” because that is what the seeds looked like to her. big fat dog ticks. She never knew the real name for them. She taught me to just gather the seed pods and leave in bucket all winter and in spring she just soaks the whole pod and it busts open to water the seed and then she digs a trench and pours the bucket into it. Always had a great line of them. I’ve heard they will keep moles out of your yard if you plant at edges. 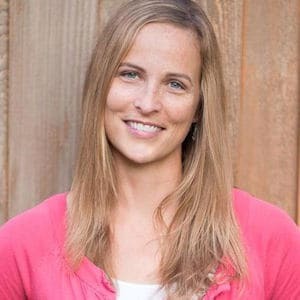 My husband won’t let me plant because of our young grandchildren and the poisonous nature of the plants. Haha, that’s a fitting name! I never thought of them looking like fat dog ticks (gross!). Love it. Her method of planting the seeds is great too! And yes, it’s smart of you not to plant them because of your grandchildren! These are very poisonous, and it’s better to be safe than sorry! Wait til the kids are older. Update: my castor plants are surviving along with my other plants. In the photo, there is an elephant ears plant growing by it. Are members of the caladium family great to grow by castor? I grow these each year from saved seeds but often find they have seeded themselves in the border. It’s January 13 th and one in a pot against the house is in full leaf and flourishing. Wow, you must live somewhere warm! I love the origin story of your seeds, so many people have an origin story for their castor bean seeds. It’s so cool! So, when should the castor plant start blooming? They bloom in late summer/early fall. Awesome, thanks for all your added tips! Since about 1985: I have grown green castor beans in Minnesota, 10-12 feet tall. Red and Pink ones in northwest Wisconsin, 5-6 feet tall except in sandy soil without enough fertilizer. I use old manure and kelp tea. Everyone is wowed by them. Best story — one day an old truck pulled into the driveway with southeast Asians, spoke no English. I had seen them going to and from farm fields. They asked, using sign language, if they could pick some leaves for their son’s sprained ankle, as a poultice. Just don’t let anyone eat them, and they’re no problem. This is why humans have big brains. Oh — I sprouted very old seeds this year from plants grown here in Wisc. I thought the plants weren’t even large enough to mature their seeds. ALL of them germinated and are growing nicely in pots. Will transplant in a week or two. Wow, great story! Love it! Hi, I got one of these today as a seedling from a co-worker. The plants look beautiful, and I am excited to plant it…except that I keep seeing the mention that the whole plant is so poisonous. If I have a dog that has the run of the back yard (where the plant would be located), should I not plant one at all? I keep seeing people mentioning grandkids; my kids are 11 and 13 and would know not to pick up a seed and try to break it open and eat it…just not sure about the dog. Also, we love seeing the squirrels run around…will it kill THEM? Finally, I read the comments and saw one mention of wearing gloves while working with the seeds. Do you not go near the leaves, etc, of the plant without the gloves either? And do you worry about anything transferring from the gloves to other skin areas? Just not sure how careful you have to be. Thanks for your help! Hi! Yes, all parts of castor bean plants are poisonous if eaten. So, if you’re worried about your dog, then I wouldn’t plant it. Better to be safe than sorry. The only reason I mentioned wearing gloves when collecting the seeds is because the seedpods are spiky, and can be hard to break open with your bare hands. Not because of the poison. I handle them bare handed all the time. I haven’t seen any dead squirrels laying around, but yes, it would kill them if they decided to eat it. Animals usually have a pretty good sense about these things though I think – we have plenty of healthy rabbits and squirrels running around and I grow castor beans every year. Over 2 months now and my castor plant, though a baby, looks gorgeous. Btw, I touched a castor plant seed POD before, and it was not spikey. They felt like gentle, thick hairs. But yes, they did win a former world record on most poisonous plant IN THE WORLD! Good luck with your plant. Altho this is a poisen plant there are many others in the plant world….. I have read up some on this topic with the Castor Bean ….The seeds are the most toxic but then they are behind a prickly ball chamber that has to be broken to get to the seeds…I would be afraid of cattle chickens or other non domestic livestock as they will eat anything right.. If you have a big raseling dog I would not plant this castor in his/her area… altho the entire plant would get anyone ill if they chewed a branch tho… Nature has her way to let birds and animals know what is dangerous…. Remember if the temp falls below freezing in your area the plant and seed pods will all freeze off… You can also cut out new seed pods as they develop, leave one for your own replacement seeds, to be stored inside the house all winter… Remember this plant loves the heat and sun.. A big feeder too I feed my castors, Alaska fish amuslion … Bottom line if it is your first attempt then use caution as you seem to be doing…but overall these are justr way cool plants in the cooler temps of the north.as it looks soo tropical…. Has anyone pinched out centre growth of plants to keep them more compact? Last summer mine grew so tall and the beauty of the leaf clusters ended up with leaves far apart from each other. They looked sparse and leggy… if I am able to pinch for my re compact plants will i loose the red spiked flower pods? I have never tried pinching them. Do you have them growing in full sun? I wonder if they grew tall and leggy because they weren’t getting enough sun. really impressed with you guys comments. actually am planning for castor plantation this year but I need to know how long it takes to grow from germination to maturity for harvesting. I don’t know the exact number of days, but my castor bean plants take all summer to produce mature seeds (I live in Minnesota). I usually plant castor bean seeds in May, and then harvest the seeds from the mature plants in Sept/October sometime. So, I’d say 4-5 months. They may produce seeds faster in warmer climates though. Can the Castor Bean plant be grown as an indoor plant? We have high ceilings, so height won’t be a problem. 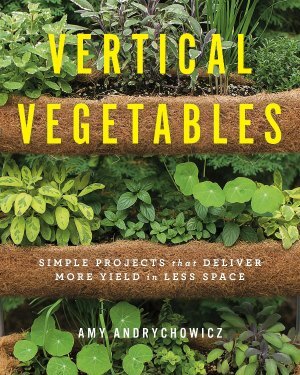 Also, rather than just starting the seeds inside in the spring, am I able to plant them like in Nov. or Dec. & grow them that long before transferring them outdoors? Castor beans are annual plants, so they would not make good houseplants. You certainly could start your castor seeds that early, but they grow really fast and need a lot of light. So, you would definitely need bright grow lights to keep them from growing leggy until you can move them out to your garden. I plant Castor beans each year (Mid March/Zone 6) from seeds from the season before. I have a seed mat placed in a plastic bin and after soaking the beans for 1 day I plant them in a seed starting mix. 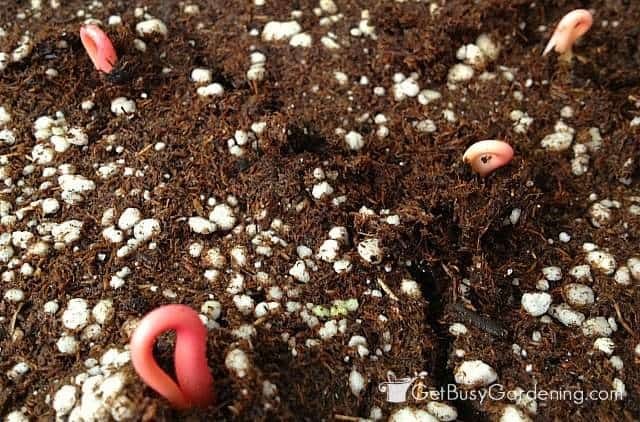 Each time they sprout anywhere from 5 to 10 days (which is faster than normal). I put them under a grow light when they break thru and transplant in potting soil after they get their true leaves. I put them under the grow light until I can move them outside during the day. Once frost danger has passed I plant them in the ground. If they are in the sun, they will grow well above 10 feet, shader areas, they will stay smaller. Grow with caution if you have animals and completely remove the plant and pods at seasons end. Each and every year I have people comment about how much they love this plant. 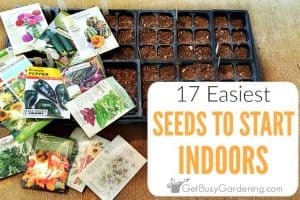 Starting seeds indoors is great late winter gardening therapy (and how I justify the cost of heating mat and grow lights). Awesome, thanks for sharing your tips for growing castor plants from seed! I love them too, and always get tons of compliments when I grow them in my garden. I’m growing them for the first time, they are in my garden and about 5” high, maybe too close to each other! Should I pull a few? They are about 3” apart now!! Yes, I would thin them out if I was you. Once they start to grow larger, the taller castor bean plants will crowd out the smaller ones anyway.